« so which is it? I’m restoring the ladies version of this bike. Yours looks fantastic! Love the saddle. Mine has the original saddle, and what appears to be an original saddle bag (same vinyl and stitching). Glad I found your photo for reference. I just bought one of these at an Estate sale and I would like to replace the decals which are a little scratched up. Any ideas on where to find replacement decals? I have the very first Sears 3 speed bike. It was made by the Davis sewing machine company and know as the Chief. Sold threw the Sears catalog in 1915. Davis sewing machine company stopped production of sewing machines around that time and focused on bicycle production. They later changed there name to Huffman bicycle company which we know them today as Huffy. justin… you need to build a site showing all your antique bikes. your collection is AWESOME! hi, i am new here. we just bought a sears 3 speed bike for 10 bucks at a garage sale, made in austria. i don’t know much about it but we love it. it has an interesting “head-light” also between the handlebars. it also had a basket. the bike is very sound, runs great, my husband just had to fill the tires with air! 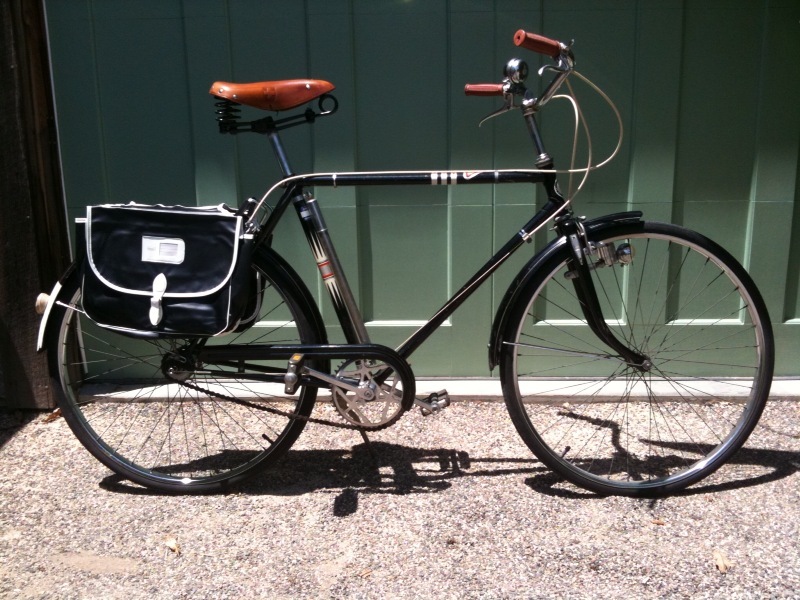 its a ladies bike, large wheels, and a black leather saddle seat with studs. the paint is such a dark blue it is almost black, and there are white strips, red, and some white pin-striping. just needs a little cleaning which i’ve already started. its a lovely bike. will take pictures in the future. please tell me more about this bike. I don’t know any more than what I wrote as regards these bikes… Probably made by Steyr Puch in Austria. They make military vehicles… and 4wd stuff for Vanagons and mercedes trucks these days. I am mostly fascinated by the fact that a big chain store was able to market well built stuff from Europe and sell it at a fair price back in the day. These days that bike would cost 1000US$ to buy in Austria! Omar… take the bike to a bike shop and have them rebuild the front hub… the bottom bracket… and lubricate the rear hub. If you know how to do this.. do it yourself with some fresh grease. Best luck. Hi! I own an old Sears and Roebuck bike that has no speeds, skinnier tires, fenders, used to be red, has the sears and roebuck plate on front but can’t read any other markings. I think it is pretty old but would like to know how old! I bought it at a thrift store in San Diego about 16 years ago for $25 and have been riding it ever since! I love this bike! Just wondered if you have any info or could direct me to a website that would have info for me. Thank you! I have a bike just like this one that used to belong to my Grandpa. I ride it all the time and it’s in excellent condition. Well It got knocked over the other day and broke the rear reflector into many many pieces. Does anyone know where I can get another one? Beautiful bike. Do you happen to know the size of the bottom bracket? I have the same bike and the crank has seen better days. 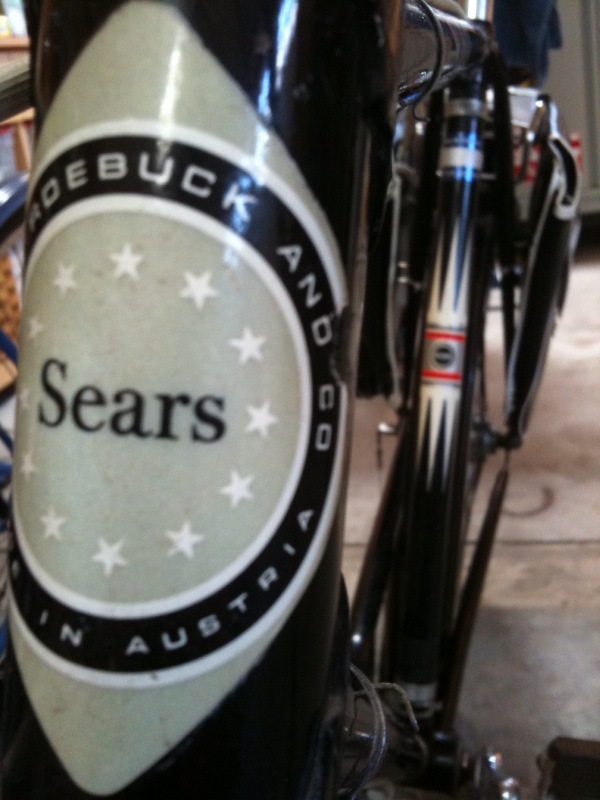 I have a nice example of the 1969 version of the Sears logo-ed bike in mostly original condition. The tires are original! I ride it with the Houston Rusty Riders group every Sunday morning. I am now cleaning up a ladies bike that is of the same design. It has 1967 stamped on rear hub. Both bikes were made in Austria although I noticed a frame member stamped “Made in Germany.” I find this 3 speed to be a very competent upright cruiser. Happy New Year! I have this bike in a Ladies version also. About a year ago I was riding it (commuting to work) and CA-CHUNK the gears or breaks gave out (the wire is loose) and the back tire wedged up against the frame. First–I want to get her mobile again. Second–I’m curious about restoring it (but cannot afford it I imagine). Any suggestions? There are a couple of bike shops I’d consider but if I can do it on my own it would be fantastic. P.S. I wonder if LInda checked out the decals? Find a “bike kitchen” near you… They teach you how to fix your own bike.. Have tools etc. start by looking up your local bike advocacy group or bike club. Good luck. I bought this exact bike from Sears in 1963 for myself. I was 11 years old at the time. I used it extensively the next 5 years (until I bought my first car) and loved it!. I did many long rides (10 miles or longer). It was an extremely well-built bike. At the time of purchase, it was the only “English” styled bike (3 speed on handle bars, lightweight, skinny tire) in my small town of 5K citizens. I won several local races using. It annihilated the competition (big tire Schwinn’s). I was taught at a very early age, that if you wanted anything, you’d then work, save-up the money, and buy it yourself. My parents could not afford anything (toys) for the three of use and Christmas and Birthdays were “Spartan” events. If there was a gift, it was clothes or shoes. I did not care as I thought that was the way it was in life for everyone, until my mid-to later teen years. Though I recently saw a price in a 1964 Sears catalog of ~$45.00. I’m certain I paid much more (upper $60’s) in 1963. My mother sold it about 10 years post my college graduation. I wish I had taken over responsibility for it. It was still in original condition and rode like new. In about 1962-63 I bought this same Sears 3-speed bike (advertised as “Made in Free Austria). I worked all summer on a farm building fences (I got 10 cents for each fence post hole I dug), milking a cow by hand, mowing lawn, etc to save the money to buy it, and it was $39.95 at the time (maybe on sale because I don’t know what the list price really was, but I know I paid $39.95 and probably some tax). I’m unsure of the exact year because I might have been in 5th, 6th, or 7th grade, but I think was 10 or 11 years old.